The slim and compact size of this corner LED channel will make the mounting of your LED strips easily and beautifully for both professional or DIY lighting projects. It matches most popular LED strips,both flexible strip or rigid strip, i.e, 5050 flex white LED tape, 28358 warm white LED strip, rgb led strip lighting. 1. Corner slim aluminum LED channel greatly increases the applications of your LED strip lights. 2. 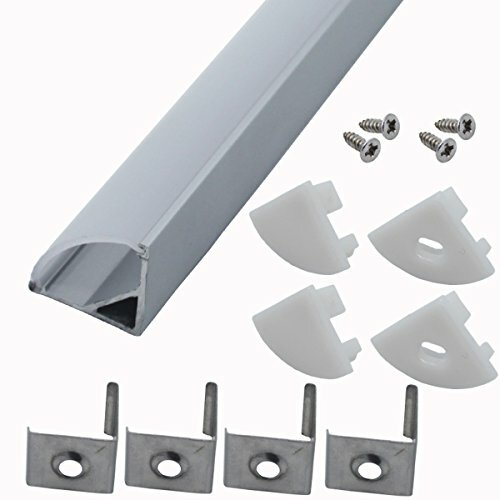 Aluminum channel diffuser and cover with all the accessories including end caps, moungting clips and srews make the mounting of your LED strip much easily. 3. LED channel system helps the heat-dissipation for your LED strip lighting and ensures a good lifetime for your LED strip. 4. Aluminum housing track with strong and robust diffused PC cover reduces light glaring of the LED strip lights. For wider aluminum channels for 16mm wide led strips, pls search "Litever 6-Pack 3.3ft/1 Meter 9x18mm U Shape Aluminum Channels". For flat slim aluminum channels, pls search "Litever Slim Aluminum Channels U Shape". V shape 90 degree corner back aluminum channels for LED strip mounting. 180 degrees seamless extension brackets optional for connecting 2 pcs into 2 meters. Pls search "LL-016-180D". 90 degrees corner connectors optional for creating 90 degrees corners. Pls search "LL-016-90D". Enough end caps and mounting clips for you to cut the V aluminum channels in shorter pieces. 12 pcs end caps with wire holes,12 pcs end caps without hole, 24 pcs mounting clips.